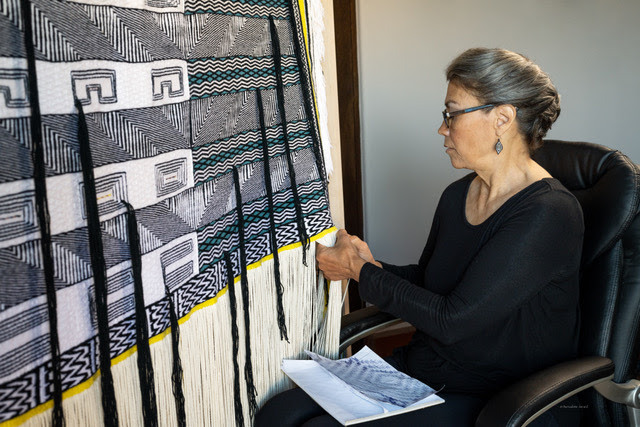 Evelyn Vanderhoop (Haida) weaving a contemporary masterwork for the MFA Boston Collection, 2019. 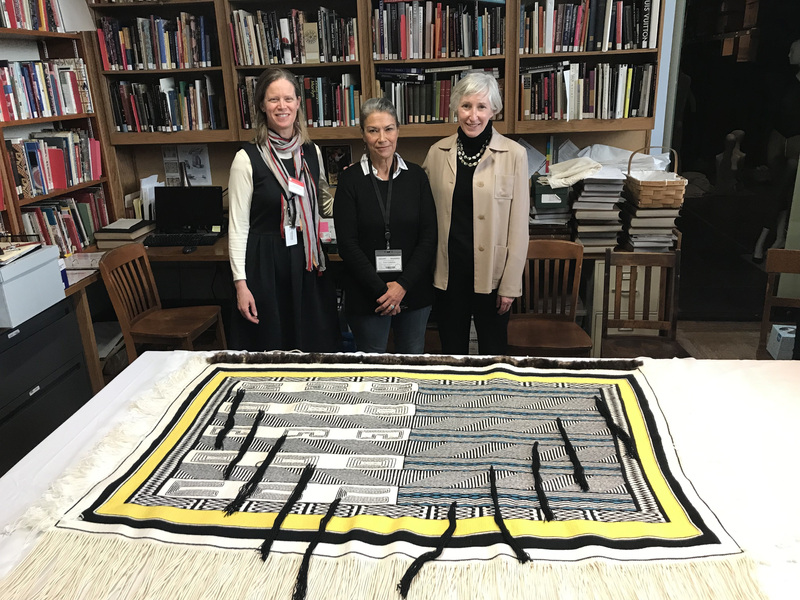 Two years ago we embarked on an exciting project with curators at the Museum of Fine Arts Boston and Evelyn Vanderhoop (Haida): the weaving of a contemporary Ravenstail robe for the Museum’s collection. 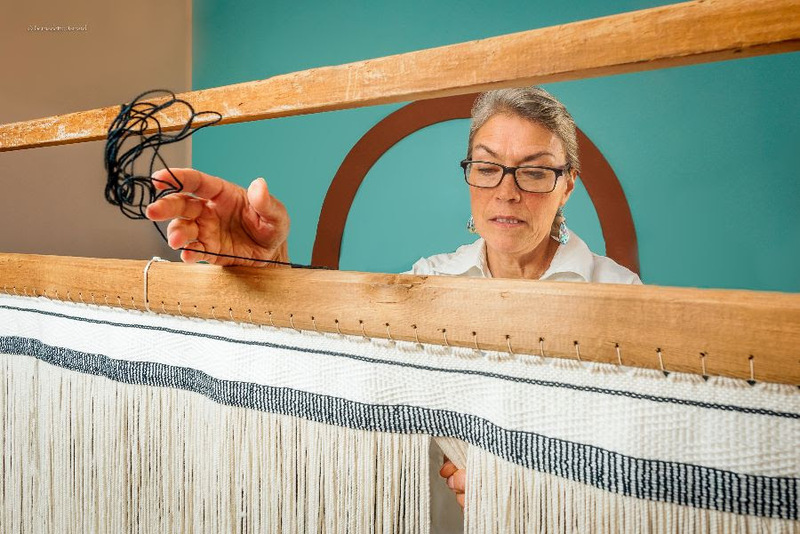 Vanderhoop–the daughter of renowned weaver Delores Churchill–has spent the last year weaving an exquisite robe for the Museum, and now the time has come to dance it and formally present it to the Museum. For our friends and supporters in the Northeast, this is an amazing opportunity to watch a contemporary masterwork being danced, and to witness an historic cultural event! Accompanied by her daughter, master singer and drummer Tiffany Vanderhoop, Haida artist Evelyn Vanderhoop will dance the robe that was commissioned for the MFA’s permanent collection. Can’t make these events? The Robe will be on display for a year at the MFA Boston, accompanied by the historic Swift Blanket! 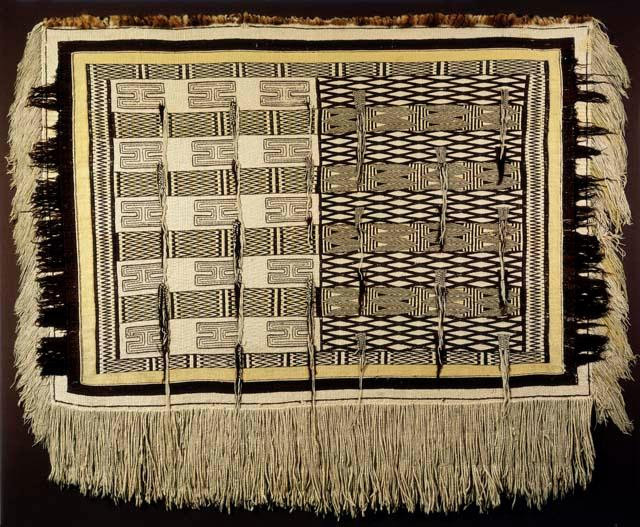 One of the most celebrated First Nations historic objects is the Swift Blanket, made sometime in the late 1700s in British Columbia, and now held by the Peabody Museum at Harvard University in Boston. 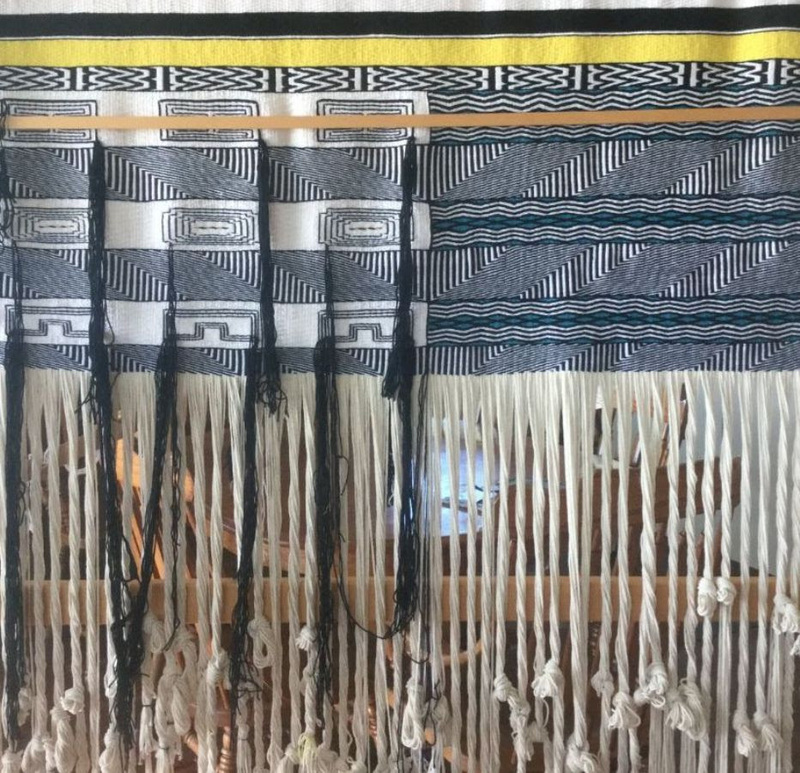 Among textile experts the Swift Blanket is an important example of Ravenstail weaving from the height of the “golden age” of Northern Northwest Coast artistry. The “Swift Blanket.” Ceremonial blanket woven of mountain goat wool, Mid-eighteenth century AD, Northwest Coast. Collection of the Peabody Museum of Archaeology and Ethnology, Harvard University. Across the river at the MFA, curators at the MFA’s textile department sought a contemporary weaver who could create a modern Ravenstail blanket, opening a direct and rare dialogue between historic and contemporary masterworks. After a search of many weavers, Vanderhoop was chosen to create the robe. Evelyn’s mother is the famed weaver Delores Churchill of Ketchikan, Alaska. Delores assisted weaver Cheryl Samuels in weaving the first Raven’s Tail blanket made in contemporary times. 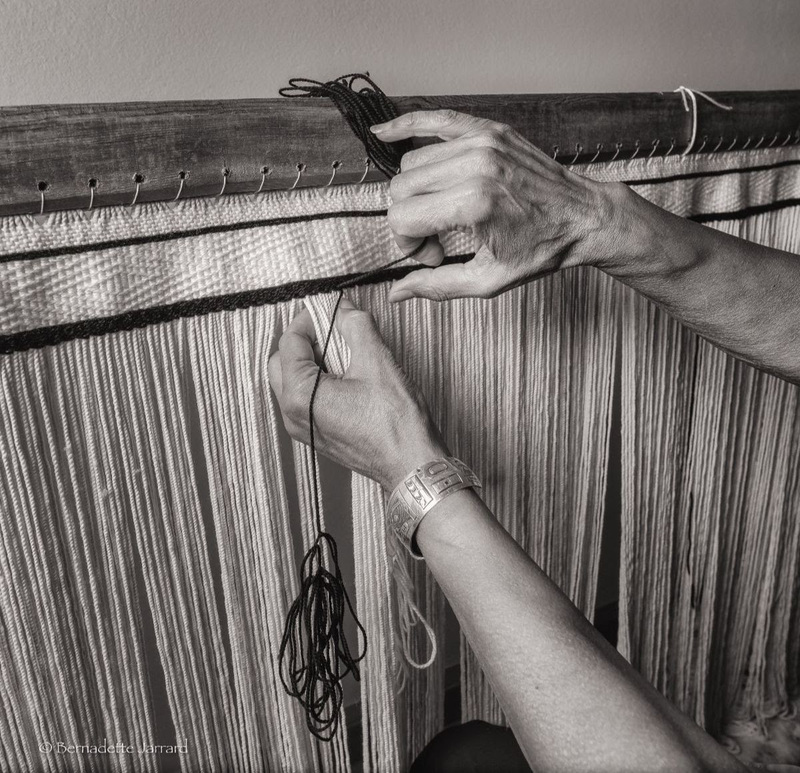 Delores taught Evelyn Raven’s Tail weaving, and Evelyn is now considered a master. Stages of the weaving process, showing Evelyn Vanderhoop at work. All photos by Bernadette Jarrard. Robes and blankets are emblematic of the flourishing, robust cultures of the Northwest Coast, where the resources available were bountiful, the climate was mild, trade routes were quick and open, and cycles of salmon allowed for stability and solidity. These robes represent a great society, where “well-made objects”* of both utilitarian and ceremonial purposes were the standard, and an artisan could reasonably expect to spend an entire year weaving a Chilkat or Ravenstail robe without interruption. The cultures of the Northwest Coast collapsed tragically and near-completely, but have recovered through the tenacity and perseverance of their members. In many ways, the weavers have been a significant part of this revival and rebirth. The cumulative knowledge required to weave the complex objects of the Coastal cultures is the sum of years-long apprenticeships, and more than just technique is passed from generation to generation. Core ideas of cultural history and identity are also transmitted, making weavers the heart of these tribal nations. * A phrase used by Haida master artist Bill Reid.